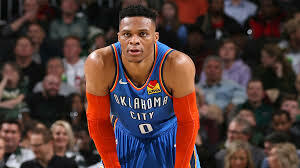 Russell Westbrook with a 15-11-17 triple-double leads the Oklahoma City Thunder to a win over a shorthanded Milwaukee Bucks, that helps the franchise lock up the sixth seed in the West. MILWAUKEE (AP) – Russell Westbrook got his 34th triple-double of the season and the Oklahoma City Thunder beat the Milwaukee Bucks’ backups 127-116 to lock up the sixth seed in the Western Conference playoffs. Oklahoma City played without injured Paul George, but Westbrook, Jerami Grant and Dennis Schroder led a hot-shooting effort from 3-point range. Westbrook had 15 points, 17 assists and 11 rebounds. He moved into a tie with Magic Johnson for second place on the career triple-double list with 138.